Sites C-1 (Mont Apica) and C-2 (Lac St. Denis) - Installation of AN/TPS-502 will be delayed until towers and connecting passage ways are completed. Estimated installation will not begin until October 1955 at either site. Sites C-3 (Foymount),C-4 (Edgar), C-5 (Chatham), C-7 (Parent), C-8 (Senneterre) and C-9 (Falconbridge) - Installation of AN/FPS-6 scheduled to begin July 56 with site C-4 (Edgar). Primary Communications - Approximately 30% of the primary communications for the sites is installed. Due to the failure of the communications contractor to meet the specified performance requirements, further installation has been deferred pending selection of suitable replacement microwave equipment. Holberg (C-18), Comox (C-35) and Tofino (C-36) - AN/TPS-502 installation at site C-36 (Tofino) will be completed 31 July 1955 and at sites C-18 (Holberg) and C-25 (Comox) by 15 Aug 55. Sites C-10 (Ramore), C-14 (Pagwa), C-15 (Armstrong), C-16 (Sioux Lookout), C-17 (Beausejour), C-19 (Puntzi Mountain), C-20 (Baldy Hughes) and C-21 (Saskatoon Mountain). Installation and acceptance of the AN/TPS-502 and the AN/FPS-502 has been completed at all ADC sites. Video mapping units: not delivered during June and July as scheduled. Pinetree Project Office is endeavoring to ascertain cause of delay. AN/FPS-502 installation at R-33 (Moisie - Clarke City) complete. The AN/FPS-502 is scheduled for installation at R-11 (Halifax) between 1 July and 12 August and at R-6 (Ste. Marie) between 15 August and 5 September. Acceptance of these sites should follow within two weeks of the installation completion dates. Equipments to be installed are AN/FPS-502, AN/GPA-30 and the AN/TPS-502 installation at N-30 (Resolution Island). The AN/FPS-502 equipments have been installed and accepted at all sites except N-30 (Resolution Island). Installations and acceptance at N-30 (Resolution Island) delayed due to damage to equipment - completion now expected by 15 Aug 1955. Modification kits for the AN/FPS-502 to correct 35 degrees close-in ambiguity have been designed by CAL and called up as part of the basic equipment by the Pinetree Project Office. Installation will be accomplished as a retrofit modification. The LF systems at N-26 (St. Anthony), N-27 (Cartwright), N-28 (Hopedale), N-29 (Saglek) and N-31 (Frobisher Bay) received unofficial acceptance and are being used. At N-26 (St. Anthony) and N-27 (Cartwright) new towers are being erected and antennas are being rebuilt. Acceptance expected in October of this year. 4. REP TELECOMMUNICATION EQUIPMENT – STATUS - (Outstanding equipment only. All others delivered). AN/CPS-6B - Complete except for approximately 1% spares. Final shipment depot and operating spares scheduled for 31 July 1955. AN/TPS-502 - Approximately 80% depot spares have been shipped to Rome and No. 1 S.D. (Weston). Final shipment depot operating spares scheduled for 15 August 1955. AN/FPS-502 - Delivery of all equipment complete with the exception of depot spares, modification kits for the antenna, interference blanking and remote beam indicators. Depot spares will be 85% delivered by 31 August and complete by 31 October, with the exception of certain items recently added which will be delivered prior to the end of the year. Delivery of all modification kits is expected by 31 December. AN/GPA-30 - Video Mapping Unit - Factory delivery of first unit is expected during the summer of 1955. Delivery of Pinetree units has not been forecast due to production difficulty. Recorders - The ten recorders and eight reproducer units have been shipped. Mostly all ancillary equipment and spares are expected to be shipped in August. "ON" CARRIER - The first twenty channels of the "On" carrier system were made operational 27 May 1955. 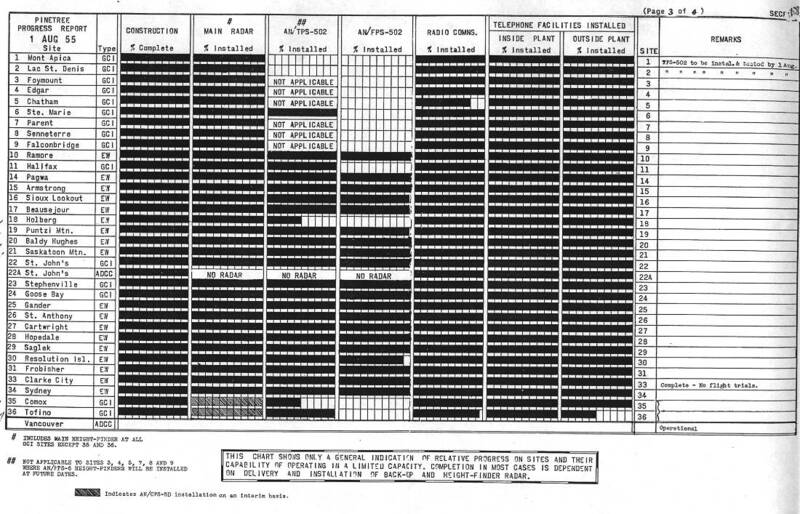 Balance of 52 channels expected operational 8 Aug 55 with three of the four systems by 1 Aug. Physical installation of equipments for the entire system is expected to be complete approximately 15 Aug 55. Installation of the Howley Repeater facility will commence approximately 15 Aug 55. POLE VAULT - Antenna maintenance crews have been busy doing general maintenance work at various sites and replacing the simplex antennas at N-29 (Saglek). Erection of both these antennas is now complete and wreckage of old antennas transported to the base of the hill. Replacements for upper back strays, lower back strays and main legs on all antennas are now in the process of manufacture by Dominion Structural Limited and Canadian Bridge Company. The upper and lower back stays are being made of galvanized structural steel and the main legs of galvanized steel tubing. Work on the living quarters at site N-25 (Gander) is complete. Overall installation, station tests, system tests and circuit order work is now complete for all stations of the "Pole-vault" project. Advance sections of all maintenance manuals are also complete. A report on teletype operations over scatter links has been prepared from results of tests carried out earlier. This report will be discussed with Bell Laboratories before it is finalized. Studies are underway to determine space and equipment requirements to expand the channel capacity of the "Pole-vault" system north of N-28 (Hopedale). An order to expand the system has been received orally from Pinetree Project Office and planning work for this project is actively under way. A design is under way for additional ventilation of the equipment buildings. Detail plans of this should be available about the middle of July. MICROWAVE - Tests are continuing on Canadian General Electric 2,000 mc. Equipment along with transmission lines and antennas. The 400 mc. Canadian Westinghouse equipment is now scheduled for delivery early in July. The fault alarm equipment was received from Canadian Marconi Company in June and installation work on it has commenced. Testing and line-up of the VF multiplex equipment is now complete. NOTE: - Because of the approaching completion stage of the Pinetree Project, a report will be issued intermittently as sufficient progress information warrants. Matrix showing relative Progress on Sites. Page 4 of 4 is missing.